Wills, Probate, Elder Law, and Estate Planning Workshop; We all want peace of mind that when we go, our plan goes “as planned” and that we have taken care of our loved ones. But, the rule is that you cannot give away that which you do not own. You may unknowingly have pitfalls and problems in your plan that impact this rule and may cause your plan to fail. 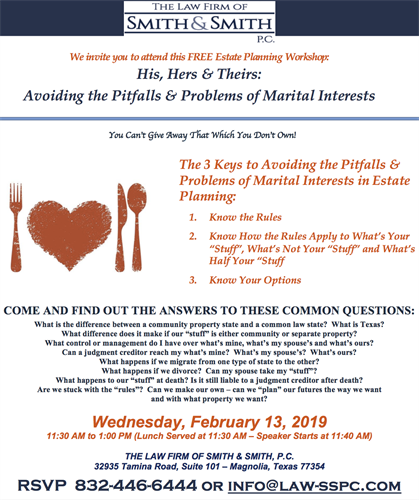 Marital interests, community vs. separate property (real/personal property), migrating from a common law state to a community property state or vice versa, marital liability, use of forms, the death of a spouse, a divorce – they all impact your plan. In this class, you will learn to avoid the pitfalls and problems by gaining an understanding of what you really own and how to properly transfer it upon your passing. Attendees interact directly with the Attorney and will receive a FREE private consultation. The Law Firm of Smith & Smith, P.C.